I love eating Spicy Perogy Pizza, loosed based from delicious Potato Perogies. 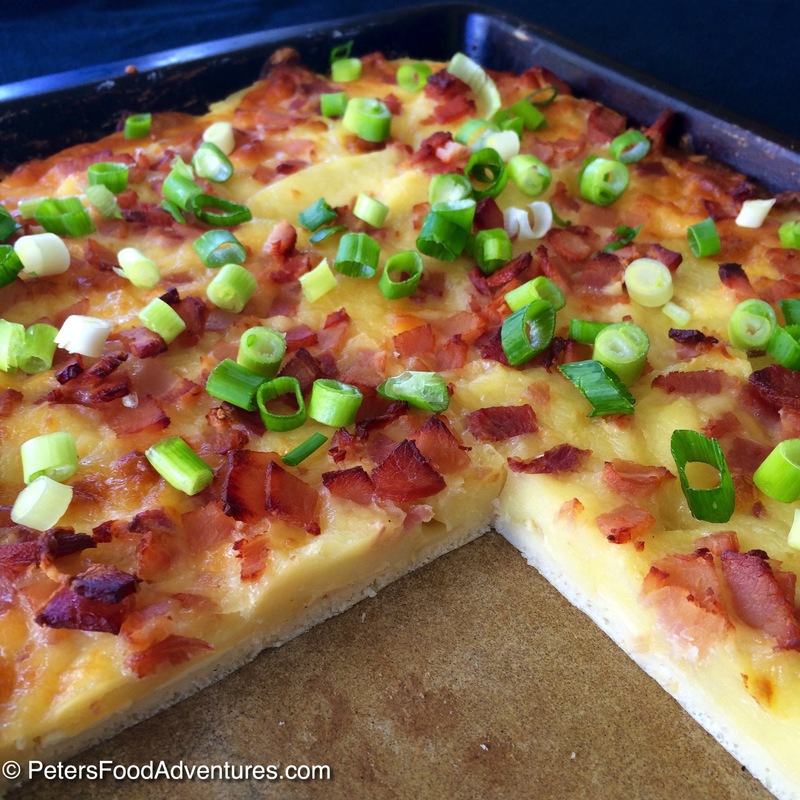 Perogy Pizza is a spicy pizza with layered potato, bacon, cheese topped with sour cream and green onion. Absolutely delicious, a Canadian classic! Depending on what part of the world you are from, you may have never heard of Perogies before, certainly not in a pizza form. Perogies are a Canadian version of a Slavic dumpling, boiled and stuffed with potato, cheese and bacon, and served with sour cream and onions. There are many variations of these dumplings, in Russian, we called them Vareniki (вареники). Now pairing Perogies with Pizza are a match made in carb heaven, what could be wrong with that! There are many copycat versions on the internet from Boston Pizza’s version. The secret of the spicy potatoes is boiling the potatoes in cayenne with the garlic and onion. You can use powdered onion and powdered garlic, but I think it’s better to use fresh. I use stoneware baking trays for making pizza and most things in the oven. You can buy ready made pizza dough, or check out my easy bread maker pizza dough recipe. Just throw in all the ingredients, and it does all the hard work for you! Spicy Perogy Pizza is not a meal that you should count carbs or calories, just ignore them, slather on the sour cream and enjoy! Bon Appetit! Приятного аппетита! Roll the dough in your pizza pan to your desired shape. Spread the sour cream evenly on the pizza crust. Lay the spicy potatoes slices, slightly overlapping each other until the entire pizza is covered and no sour cream is showing. Season with salt and pepper to taste. Add the cheddar cheese and mozzarella evenly across the potatoes. 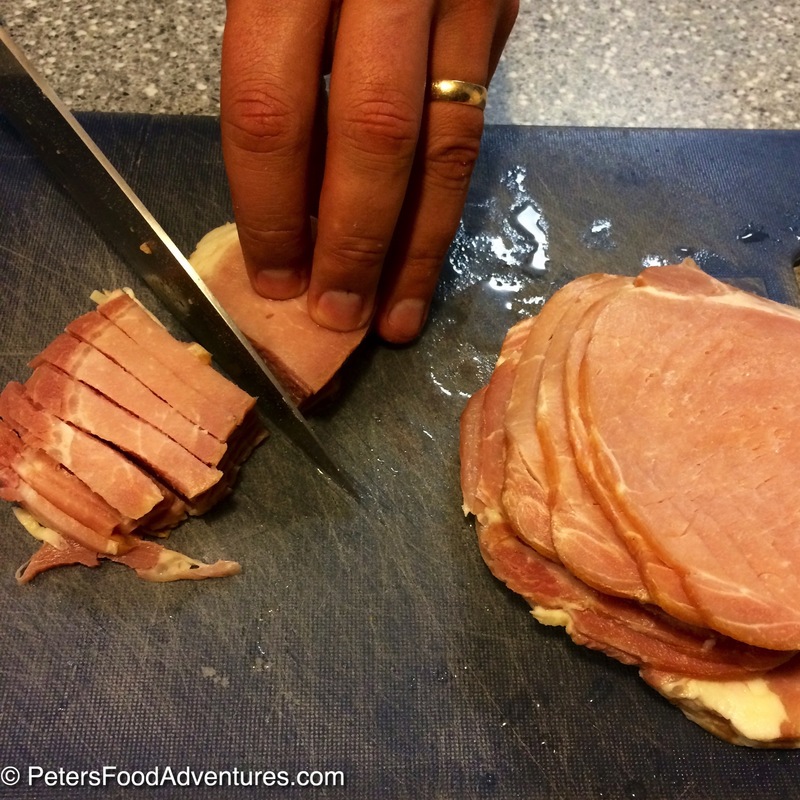 Add the bacon pieces on top of the grated cheese. Bake in the oven for 15-20 minutes until cheese is golden. 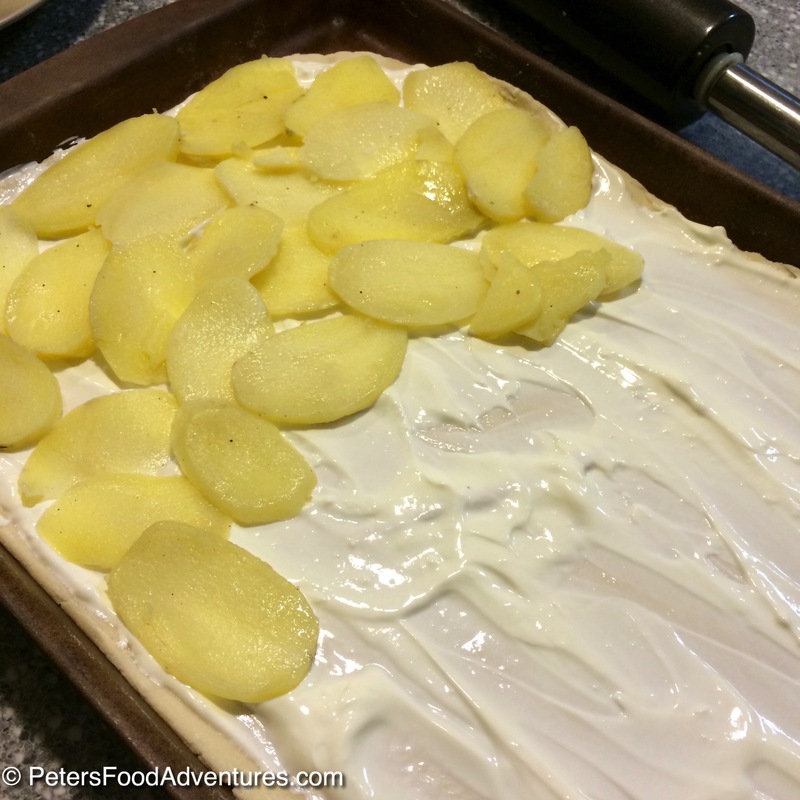 Allow to cool for 5 minutes before cutting and serving. Garnish with chopped green onions and serve with sour cream. * If you don't want spicy potatoes, leave out the cayenne pepper when boiling the potatoes.